Celebrity trainer David Kirsh claims that he didn’t previously approve of crash diets but he changed his opinion when he was approached by Extreme Makeover to create a diet for the participants of the show. He wrote his Ultimate New York Diet book so as to give the general public access to this quick and effective weight loss plan. Kirsh states that the combination of nutrition, exercise and mind-body focus will result in a loss of 14 pounds in 2 weeks. He says that he now promotes the quick fix approach because it is the best way of motivating dieters who have a lot of weight to lose. With gradual weight loss plans dieters become discouraged and are more likely to give up he says. This is a very strict low carb diet plan that eliminates alcohol, bread, sugar, coffee, fruit and dairy products. The book outlines an 8-week program that involves keeping calories at what is generally regarded as a starvation level of below 900 calories per day. Kirsch makes no allowances for gender or activity level. The first two weeks are the strictest and following this there are two additional phases where carbohydrates are gradually reintroduced. Kirsch recommends the use of protein shakes and lean proteins such as egg whites, chicken and turkey breast, lean meat and tuna. Low carb vegetables, especially salads, and essential fats are also included. An essential aspect of the plan is an intense daily workout that lasts for 90 minutes and includes a combination of cardio and resistance training. The New York Diet costs $24.95. It may be necessary to purchase exercise equipment such as light dumbbells and a medicine ball. Kirsh also recommends that his personal brand of protein shakes be consumed twice daily at a cost of approximately $3 per serving. Rapid weight loss can increase motivation to stay with the program. High in good quality protein and essential fats. Provides a lot of information about exercise as well as recipes and tips on how to select the best foods when eating out. Calorie intake is so low as to be considered dangerous and dieters are at risk of nutritional deficiency and loss of muscle tissue among a range of other potential health problems. Recommends the same calorie intake for everyone regardless of individual needs. Eliminates entire food groups such as dairy products, grains and fruit. Protein shakes may not be satisfying for many dieters and reliance on these products can prevent dieters from learning healthy eating habits, which is essential if weight loss is to be maintained. Initial weight loss can be deceiving as low carbohydrate diets promote loss of body fluids which will be regained when carbohydrates are reintroduced into the diet. Not suitable for those without at least a moderate degree of fitness. Kirsh advises activity levels far in excess of what is necessary for weight loss or for optimal health. If you are looking for a diet plan that will help you lose weight for a special occasion the New York Diet may be the healthiest way to do so and no doubt dieters will achieve results with this extreme approach but Kirsh’s claim that rapid weight loss is healthy is outrageous. Any plan that is this low in calories and restricts entire food groups is severely risking the health of the dieter as well as the likelihood of maintaining the weight loss on the conclusion of the program. 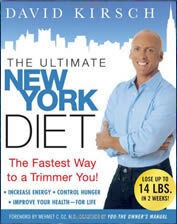 In addition the New York Diet is promoting a mentality of dieting rather than encouraging readers to undertake a healthy lifestyle approach to weight loss. It is far better to undertake a long-term gradual and balanced approach to weight loss that considers the physical and psychological health of the dieter above the need for instant results.